(7-b) If the Crossover Point < IRR, then accept the project with higher IRR. (8) An NPV value of zero also means the investment into that project would neither gain nor loose value for the company. Project Outputs represent the value created by a project such as new income generated, efficiency gains, cost savings from improved internal processes, new intellectual property created, and strategic benefits (such as increased marketshare, brand name recognition, incremental gains in product mix, and improved vendor relationships). Project Inputs represent expenses related to a project such as the initial investment in software and tools, development costs (such as professional employee salaries), facilities expenses (including building depreciation, grounds maintenance, service level agreements, and equipment depreciation,) deployment costs (such as sales commissions, marketing, shipping, and 3’rd party software run-time fees), goernment fees (such as sales taxes, patent filings, and corporate governance), and legal fees. So one of several projects under consideration to fund, may be the most acceptable if its NPV is a large enough positive number. In other words, a project is acceptable if the IRR is greater than or equal to the hurdle rate. Where the hurdle rate is defined as the expected rate of return on a potential investment that a manager demands before investing his or her money into a project. I have seen hurdle rates in the range of 8% to 18%, for example. Measuring the risk of a capital budgeting project can be done by calculating the coefficient of variation (CV) on the expected returns from a firm’s asset portfolio with and without the new project being undertaken. Since the CV is defined as the ratio of the standard deviation to the mean, it can be used to determine how much volatility (risk) will be assumed in comparison to the amount of return expected from the proposed project. Read on to learn how to manage the financial data behind project proposals with all 4 of these complicating factors taken into account. If you prefer to use Microsoft’s Excel, an open source office package, or google’s hosted office suite, then you can use the equations I develop here to handle the calculations. 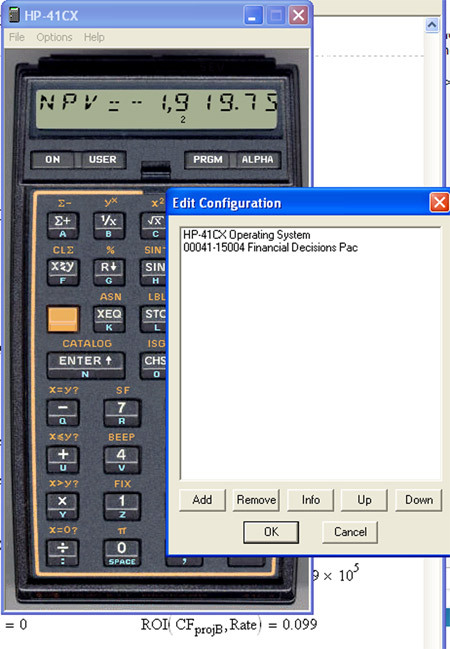 In this Mathcad example, two projects with the same basic financial data are compared. Project A is a typical project with estimated sales (as a result of project completion) that builds up over time. Project B is not typical, but is a good test case. Project B uses equal payback amounts over time – similar to an annuity. The plot of NPV vs. Rate shows that if the Rate is zero, the NPV for both projects are the same. The plot also shows that the hurdle rate must be set much lower for Project A to be approved by a firm’s finance team in comparison to project B (looking at NPV equal to zero in the graph). Yet project B is not a likely outcome either because the sales forecasts aren’t realistic. Therefore the features and benefits of project A could be re-evaluated such that estimated sales over time increases enough to outweigh the initial lag in projected sales – to make up for the time-cost of money burden. I like this example even though it is far from embedded device projects. It provides a solution to the comparison between project choices that go beyond just simple cash flow. It points out that the process of getting to an ROI number can be more important to the success of some projects than the number itself. An ODM is a good reference point for engineers and executives alike in the embedded systems industry. An ODM is a design to manufacture house, often located in Taiwan, People’s Republic of China (PRC), or Singapore. These companies work with their local silicon vendors and other regional suppliers to keep themselves informed of what tools, application frameworks, middleware, and silicon that may work together for various projects they are considering. To be clear, these local component vendors are integral partners for the ODM – right where the parts are often made. The ODM then has many advantages with respect to cash flow and its associate time-cost of money: lowest possible cost for parts, improved supply chain advantage without the need to pre-purchase in bulk, lower cost of knowledge, and cheaper labor costs. The ODM also focuses on the engineering effort rather than the marketing, brand recognition, and product sales efforts that their OEM (original equipment manufacturer) clients face. The goal of the ODM is to design cool stuff and manufacture all or part of the final product for its OEM client. In Figure 2 above, I show a sample spreadsheet that would be a typical tool used by an ODM and its OEM client. How much should an ODM project cost? Take a look at the bottom line. For this project, the ODM figures on a shared IRR of 43% over an 8 year time line (only 5 of the 8 years are shown in Figure 2) using this set of numbers. A rate of return higher than most any hurdle rate. As a result, the OEM client may find funding this project to be attractive (remember that the OEM will have to factor in brand, marketing, and sales costs). The 8-year time line in this example may be too long for some projects. You can download a working copy of this cash-flow spreadsheet or their task-based budget spreadsheet from Bird Foundation’s web site and use any time-line you like for your next project. Take a look at lines D, for development expenses, and C, for capital expenses. These two lines are where the operating system, development tool, and component vendors live. The cost of engineering and project management charged by the ODM lives here too. It is interesting to take note of the software tools and operating system choices available to the ODM. These are some of the only components that are not designed and built in or near the ODM’s location. Does Microsoft Windows CE make a better choice, or Wind River’s VxWorks, or should an embedded Linux version be the bases for development tools on this project? Well it all depends. Flexing the financial estimates for these two lines D and C are often a point of significant debate for a sales team or a roll-your-own internal engineering team. In this case, startup and recurring costs are important. Time to market is another point of consideration – here again the time-cost of your firm’s monetary assets will come into play. I invite sales and engineering teams to study the other numbers on this sample spreadsheet and envision how their product or service value might affect the final calculation of IRR. There can be further discussion on the effect of each financial component with respect to your position – there is likely no single right or wrong answer. One ROI strategy for embedded components and tools software vendors is to consider building more relationships with an ODM’s trusted local hardware component suppliers. So where can you get more information on this spreadsheet? The answer can be found with the Bird Foundation. A grant giving organization that focuses on building engineering relationships between Israeli companies and OEM companies in United States – who in-turn may include an ODM partner. The spreadsheet example in Figure 2 comes right out of their guidelines for financial and project management (see Proposal Preparation Guidelines page 28). I invite you to learn more about this foundation, how it may work in developing technical partnerships with international companies you can leverage; and their great guidelines offered on the Bird foundation web site. Indeed this is a great example of using ROI as an ethical framework between partner companies from a global perspective. by Timothy J. Gallagher and Joseph D. Andrew, Jr. Copyright 1997 by prentice-Hall, Inc. I invite you to use this blog post’s comment facility to share your experience as an engineer, innovator, sales manager, marketer, or executive. Do you think a financial vocabulary can be used to build an effective (and ethical) balance for your team between consensus and innovation? This entry was posted on Wednesday, September 26th, 2007 at 3:15 am	and is filed under Component Marketing, Component Projects. You can follow any responses to this entry through the RSS 2.0 feed. You can leave a response, or trackback from your own site. I guess you’ll read my blog..
Nice job in covering so many key concepts in a fairly short blog post. I especially liked your examples around embedded Linux, Bird Foundation, and the foreign ODM designers. 2) Your interest rate, R, should always be an annual rate – but even then – interest rate is changing all the time and is not predictable. For these two reasons I don’t think NPV is a good function for financial work in general. So I question why you would even try and make it the “heart” of your ethics for engineering manifesto? I applaud Ron for providing perspective whereby people doing engineering work and people doing financial-management work can better coordinate. Permit me to comment on his material. My advice includes the following. • Know what decisions you are trying to make and what intent you are trying to convey. • Decide to what extent you need make financial estimates (or provide financial history). • Select appropriate financial calculation tools. • To the extent you use NPV (net present value) and the formula Ron provides, consider the following. • Decide on a time-frame, T, for interest rates, such as R. Consider that many people will – unless otherwise advised – think “per year” and that using “per year” may prove appropriate. In any event, state the timeframe – “per year” (T = 1 year), “per month” (T = 1 month), or whatever. • Replace the exponent-use of k with t(k)/T, where t denotes the elapsed time from “now” and k denotes the “number of the transaction.” Transactions (payments and receipts of moneys) often do not occur on a completely regular schedule. • Consider that each CF and t(k) may be an estimate. • Consider that R may be 1-number an estimate of a quantity that, in reality, varies over time. • Consider that, with all other parameters fixed, NPV varies with choice of T.
I am using NPV, equation 1 in this blog post, as a financial framework for comparing two or more engineering projects. I believe it to be useful for making accept/reject project change proposals by engineers and business managers alike. I agree that R may not always be a simple constant, but may be a different value for each increment of cash flow. With that variability in mind, the incremental cash flow should indeed use a variable interest rate assigned to each cash flow increment. The interest rate R, would then simply be R(k). This doesn’t change the nature of the equation. See the plot comparing NPV and a variable interest rate spanning 0.01 to 99 percent for a visual expression of just how sensitive R is to the NPV equation – one of the draw-backs to using NPV in the first place. Meanwhile, for comparing two projects, R is often defined as the hurdle rate. Where the hurdle rate is the minimum rate of return needed before any given project proposal becomes attractive as a financial investment. In this case, a simple constant works great. The notion of time is already expressed within the NPV equation, without using an explicit variable like t(k). Instead, time’s behavior on expenses and incomes during the life of a project is built into the incremental cash flows summed together. When looking at the merits of a single project, a reasonable interest rate R or R(k) may be used. Just as there is a unique cash flow value, CF(k), for each period of time, so too a unique R value, R(k), could be included in any NPV calculation when R is estimated to change predictably over the life of a project. It is the lack of predictability in future R values that make the hurdle rate so useful as a simple constant set just high enough to make investment worthwhile as a financial investment. In summary, NPV remains the heart of my engineering ethics proposal. Asymmetric cash flows and variable interest rates may be useful to make project accept/reject decisions. For an initial common sense framework, consider the basic behavior that the NPV equation promotes. Strive to promote new projects that have lower initial expenses and higher payback values sooner during the life of your intended product development project – that is the heart of an ethical framework for engineers that in turn makes investors happy too. Yet as Thomas J. Buckholtz and MasterFinanceer are saying, the NPV equation is in fact not very good at comparing projects when one project is either more strategic or expected to be more disruptive in the marketplace. I hope this comment helps to simplify an otherwise complex NPV equation. Simple enough for engineers, marketers, and executives to use as a common framework for decision making and team consensus. Future blog posts may indeed explore the nuance of a more complex numerical example. You have to look at cash outflows and inflows. Outflows are your investments, inflows are returns. prefer NPV approach to proj financing. I agree that my sample test case comparing two projects is too mundane. It was meant to be simple so others can follow. What may be needed as a follow on post is a real-life example on how to effectively move NPV and IRR out of the financial domain and into engineering due diligence. This might include market attractiveness, time to market, and cash flows that bundle a mix of income and expense. Many text books and financial preso’s conclude that ROI does equal cumulative NPV/PV. From a purely MathCad style perspective, I am interested in taking the NPV equation (figure #1 in this blog post) to its natural limit of N := infinity. Move the equation into the domain of a calculus boundary value problem. This may lend itself to some automation with less of a need for special case consideration for a more uniform ethics discussion between engineers and business stake holders. Thanks for the positive interest in bridging the conversation gap between naturally self-interested engineers and equally naturally self-interested business managers. I have seen the problem time and again where it can be hard to weigh the advice of several engineering options with the nagging thunder of “just get it done as soon as possible” by the business team. Using a financial equation seems like a neat solution to me because it covers both the time issues and the money issues in an ethical or fair way that helps even the playing field between those that understand the technology and those that understand the financial risks. I will ping you before crafting such a post and if you have future ideas please let me know. I’m trying to help you sort out issues with financial computations. You discount the future value and get the present value. This is a fundamental equation of finance, time value of money. NPV concept is different. It’s “Net”, meaning that you add all cash inflows and outflows. In the example on slide 17 $100,000 is a future value, it’s 5 years from now. Today it’s worth 95,242.63 at a given discount rate of 5% annual with annual compunding. That’s the PV. IF this was the only cash exchange, then this is also NPV. If there were other cash exchanges, then you add them up. On the other hand, look at slide 27 and 28. It says that you compute “cumulative” NPV, i.e. “costs and benefits”; then divide it by PV of COSTS. In you case A, if you’d follow the slides, then PV of costs is equal the face value, i.e. $100,000. why? because you invest NOW, this means period ZERO, there’s no discounting. NPV remains the same, then you divide it by $100,000, your costs. Actually, I dont like this approach too. The issue is that NPV in numerator is already accounting for interest rate. Now when you compute ROI it’s going to be already discounted. So you get a rate which has another rate inside. In this particular case I would simply get IRR or compare NPVs but in a different way. This is all standard financial stuff, look for “project financing”, dont read anything written for “engineers by engineers” on this subject. Grab any book written for finance professionals. I really appreciate your taking the time to add value to this discussion. Reading through the slide set I picked at the top of a google search is time well spent for my readers. It has a high rank on google because it may be a popular reference. You are absolutely correct. Rich’s slide 17 does have a potential “typo” in using Present Value (PV) instead of Future Value (FV). I say “typo” in quotes because he only uses the equation in slides 27 and 28 with words that very well could be considered future value (“total cost” and “total benefit”) – as such slide 17 may simply be a typing error. Let’s ask him and see? At UC Berkeley I was required to buy my professor’s notes in a binder while he/she used our class participation to correct the notes we had to buy. These notes would often have many errors and typo’s. To Rich’s credit, he posts his notes for public use and for his students to use at no cost. So having some typos, like PV instead of FV, does not take away from his over all concepts. Your summary of my project A example using the PV set to $100,000 is fine. Using PV at year zero vs. NPV at year 4 all seem consistent – no news here. But I am glad that you restated it here using some different language for my readers. I can tell from your own blog posts that IRR is a favored technique. I agree that IRR is useful too. In fact, I use the IRR method in my blog post too. See “figure 2 – sample financial spreadsheet” in section “ROI Example: Evaluating an Infrastructure Project” above. Lastly, you bring out a very important point for engineers to consider when using my proposed ROI methods (NPV and IRR) to make ethical project decisions. The dichotomy between engineers, business professionals, and executives alike will not be solved just because an engineer tries to bridge the conversation gap by adopting a financial ROI approach. All team members must actually want to find the best solution between them. The tools you and I presented here – around time’s effect on a project’s cash flows – may still be one very promising ethical approach. This slide again uses a wrong formula. NPV of proj A is computed correcly, it’s 4.8139e+005. However its ROI is not good. It divides NPV by present value of future cash flows from investment. It doesnt make any sense. It has to divide it by -IV, i.e. $1180083. You invested IV, you are trying to compute a return on your investment, then divide by -IV. It gives a brief overview of capital budgeting techniques. What you call “ROI” is there under Profitability Index method description. Your proj A IRR is 23.39%. I dont prefer IRR over other methods, it’s just one of the methods of comparison. By including PV (present value) in the ROI equation, we can measure time’s effect on expenses more effectively. Expenses deferred to a later time in the life of a project, where possible, could yield a more effective use of capital. So the deferred expense should also reflect an improved ROI value. IV is still the initial investment at period 0.
k is the cash flow count from 1 to N, where N is the total number of periods. R does not have to be only defined as the annual interest rate. It could also be repurposed as the weighted average cost of capital (WACC). A value of 15% seems typical for a Web or network information technology project. A value should be chosen that includes enough risk for projects undertaken in specific market sectors. A web site IT project may have lower risk (WACC of 15% for R) than an embedded system development project (WACC of 20% for R), for example. See my reference below to Dr. Jeffery’s “Return on Investment Analysis for E-Business Projects” article below. Note the difference in the type of cash flow used for NPV and PV: income – expense vs. just expense. This was a significant part of the error I now see in my first draft. I plan to update my MathCad template to reflect these corrections in PV, ROI, along with a project example with periodic incomes and expenses. I need to add an IRR equation, and a PI equation too, as these make good alternative ROI calculations. In summary, I really appreciate your patience following along with me to identify these problems and in participating within this new ROI framework with me as a way to stay focused on improving the framework itself. There is an additional lesson I learned as a result of our discussion, argyn. ROI is a term less used by financial experts but often used to make business decisions. Yet ROI requires effective use of financial equations. And, the team discussion to decide whether to invest in one of two or more technology projects requires careful engineering consideration too. All combined, ROI indeed can make a good framework for ethical discussion because no one expert likely can dominate an ROI investigation – all three professional classes of experts have an equal but separate place within this ROI Framework for effective communications. To be clear, I believe the: (a) engineer, (b) finance professional, and (c) business executive, can work effectively together using ROI as an ethical framework for conversations that lead to high quality decisions as a team of equals. Each participant in an ROI-based project review naturally wants the best decision to be made. Yet, each of the members on the team may feel a little embarrassed at one point or another, as I too have during this blog conversation thread, when I realized how patiently argyn has been in getting me to realize my PV usage mistake. Why embarrassed? Well know that I understand argyn’s point, I read over my original references used to craft this blog post in the first place, and the correct PV usage was there all along. I just didn’t understand it. In my case: a reference to PV (Costs), for example, is not the same thing as just PV (Anything). Yet I am here to tell my readers now that the potential for a small embarrassment leads to an even greater feeling of reward in finding answers only a team conversation can yield. What kind of reward? To understand a point being missed, allows me know to apply this new gained knowledge in many related areas. A reward well earned by putting forth new ideas for discussion in the first place. So I say to you, try to make your best effort in a team participation, don’t be defensive, don’t give in to every “nattering nabob of negativity” either. Be patient and expect patience from others. But in the end, learn to more quickly accept other points of view that can be demonstrated to be correct. Just another positive result from ethical team conversation, I suppose. I don’t think that you need WACC at this level of discussion. It’s for debt vs equity financing. I also saw some people looking at IT projects as real options. IRR is not CC. IRR concept is a bit involved, I wont get into details. In capital budgeting one of the project acceptance criteria is IRR > CC. I agree with your WACC comment. I would need to add further discussion around equity to use this term correctly. I think I will revert back to using “hurdle rate”. But the new value add taken from Dr. Jeffery’s reference related to assignment of a higher rate for more risky projects still seems both valid and useful. Your information about ROI as an Effective Communications Tool for Engineers undoutedly is fine info for your visitors to be grateful for. Thank you for such awesome information! Hey! I was browsing Internet searching for Internet Marketing Experts Colorado and your blog regarding ROI as an Effective Communications Tool for Engineers came my way. Very interesting! You really do know your thing! I\’m gonna bookmark you and come back in a few to see your new posting! Looking forward to! Cheers!